One thing I look forward to every year when the weather starts cooling down and the days get shorter are pomegranates! I remember when I was young and these fruits were terribly rare, so getting to eat just one, juicy, messy, red pomegranate each year was such a treat. Nowadays, though, they're everywhere, but that doesn't mean I don't love them any less. I find that pomegranates are great for desserts and for sweet touches to savory dishes--I'll often make a pomegranate-orange-cranberry sauce for Thanksgiving. Anyways, here's a flavor combination that struck me last season why eating pomegranates: pomegranate-basil-vodka. And I *had* to put it on a cheesecake. Don't ask me why. I have no idea. But, despite how funny it may sound, trust me, they are good. So when Maria asked me to come up with a cheesecake dessert as part of her wedding dessert bar and when I found out she's Russian, I thought these pom cheesecakes with a hint of vodka and basil would be perfect. 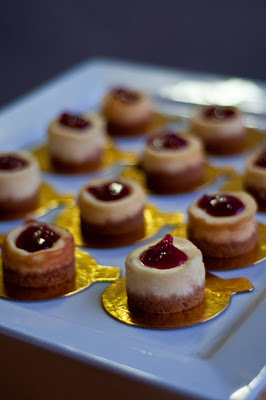 I got my round mini cheesecake pans at Sur la Table, and they are awesome. I did lightly oil the sides, though, because I'm paranoid like that, but I had absolutely no problem sliding the desserts right out. A quick note about the recipe here: I have to confess that I don't have exact ingredient amounts for the pomegranate-basil-vodka reduction because I sort of play it by feel, so please adjust what I've written here for your own preferences, whether you'd like a thinner or thicker sauce, less basil taste, or more vodka taste, etc. If you have any adjustments and improvements to share, I would love to hear them! For the cheesecakes, feel free to use your favorite cheesecake recipe. 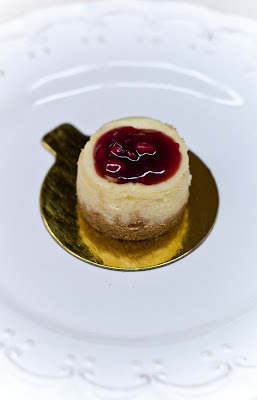 I personally like my cheesecakes baked, but I think this pomegranate sauce could work quite nicely with non-baked cheesecakes as well. adapted from the Cheesecake Factory recipe. 1. Combine ingredients and mix thoroughly. Mixture will be crumbly, but when pressed between your fingers will stick together. 3. Put the pan in the freezer while making the cheesecake filling. 2. Beat cream cheese until light and fluffy with mixer on low throughout. 3. Gradually add sugar and continue beating until creamy. 4. Add one egg at a time, beating well after each addition. 5. Add flour, vanilla, lemon juice, and mix. 6. Add sour cream and beat well. 7. Pour the filling into your spring form pan. 8. Bake in oven for 25-30 minutes. 9. Do not remove from oven! Turn the oven off, prop open the oven door ~ an inch or two, and leave for 1 hour. 10. Remove from oven, let cool in the fridge for 24 hours to season. makes enough for one squeeze bottle, but you really only need half a squeeze bottles for 36 mini cheesecakes. 1. Shred basil leaves and stuff into teabag or cheesecloth. 2. In a medium saucepan, combine juice, pomegranate seeds, prepared basil bag, vodka, sugar and cornstarch. Whisk often to break up the cornstarch. 3. Bring to a boil and boil for about a minute. If the mixture is too runny still, simmer and reduce some of the liquid until desired consistency. 4. Pour mixture into a squeeze bottle with a large opening in the nozzle (large enough for pomegranate seeds to pass through). When mixture is cool, squeeze onto prepared cheesecakes. I would like to make this as one big cake for a birthday what changes would you recommend? @Anonymous: It's been a long time since I've made this recipe, but I *think* that it should make a 9" round cheesecake as well. The one change that you'll want to make is to bake the cheesecake for longer... maybe 50-60 minutes? before turning the oven off, propping the door open, and letting the cheesecakes cool inside the oven for 1 hour.